The Fifth Annual OutReach LGBTQ Pride Parade went off with no logistical problems on August 19, with hundreds of people marching and hundreds more lining State Street and the Capitol Square for the festivities. The lead-up to the event was anything but smooth, however. A group eventually calling itself the Community Pride Coalition protested the inclusion of official, on-duty law enforcement groups in the parade and began demanding that sponsors pull out of the event due to what was perceived as non-responsiveness and silencing on the part of OutReach LGBT Community Center, the parade hosts. 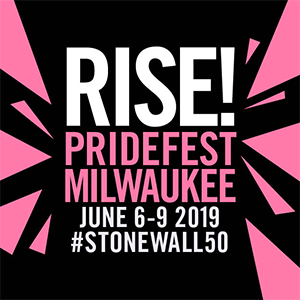 Just two weeks before the event, OutReach’s board voted unanimously to reverse course and withdraw the applications of MPD Pride (Madison Police Department’s LGBTQ employee group), as well as Sheriff Dave Mahoney, and the U.W. Police Department. OutReach went on to invite any and all queer and allied law enforcement members to participate in the parade so long as they were “off-duty, unarmed, [and in] plain clothes,” which some of them ultimately did. The Madison Fire Department issued a statement saying they would boycott the parade in protest of the decision, though they had not yet submitted an application to march. The decision immediately drew a firestorm of criticism from both within and outside Madison’s LGBTQ community, with intense arguments dominating social media for the weeks that followed. The issue seemed to highlight a stark but previously somewhat hidden divide within the community, though opinions have varied as wildly as there are individuals who identify as LGBTQ. Some conversations devolved into racist and transphobic attacks, while others represented the mixed emotions and deep personal conflicts around the problem. At a rally following the parade, activist T. Banks took the stage and delivered a blistering rebuke of both OutReach and the white population of Madison’s LGBTQ community, alleging a lack of real allyship in the struggle for justice for queer and trans people of color. OutReach has a paid staff of just 3.5, relying heavily on volunteers to run its operations. The organization took over putting on the parade in 2014, after several other groups started and sputtered in their efforts to create a long-lasting Pride event. The controversy resulting from this year’s decision to remove law enforcement from the parade itself has already resulted in the loss of several large donors to the center, threatening its ability to continue running the event, as well as its overall viability as an organization. Reactions from the crowd were mixed, with some hearty cheers and others booing, cursing, or just leaving the rally altogether. Discussions and disputes about police participation in LGBTQ Pride events are not new. The issue has come up time and again in cities large and small across the United States and Canada, with Toronto Pride making headlines this year for barring its local police from participating in the parade while in uniform or on duty, and controversies around the issue cropping up in New York and San Francisco as well. In Madison, questions first came to the forefront after 2017 Pride saw a mandate by the city to increase the number of police on security detail. This came in reaction to events in Charlottesville, where white nationalists rallied and shot into a crowd of counter-demonstrators (killing one by driving a car into a crowd of peaceful protesters). OutReach also announced an active shooter training for volunteers. 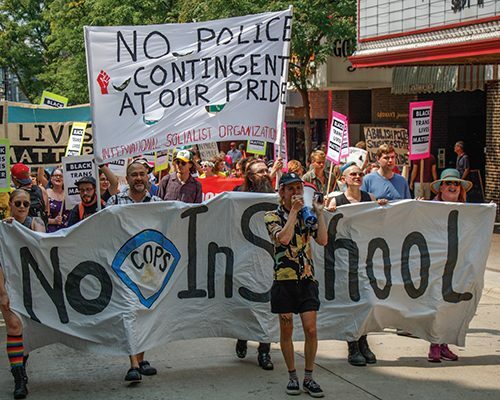 The move galvanized many within the community already opposed to police at Pride, especially for queer and transgender people of color (QTPOC), who face disproportionately high rates of targeting and arrest at the hands of law enforcement, according to a study by the Movement Advancement Project. 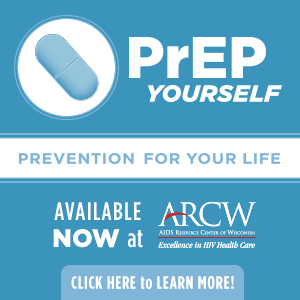 The Wisconsin Transgender Health Coalition, a group of independent, grassroots activists based in Madison, brought their concerns to OutReach (which was at the time acting as the coalition’s fiscal sponsor). Jay Botsford, the group’s program director, had noted that they and others argued that the increased police presence would make people feel less safe, and that cops should be removed from the parade entirely. One such session was held shortly after the parade last year. Organized by Shawna Lutzow, who was volunteering at the center, and her fiancée Johanna Heineman-Pieper, the event was part of a series called “Conversation about Racism within Queer Communities.” Facilitated by Kiah Price, who identifies as a multiracial Black genderqueer lesbian and is a member of the International Socialist Organization, the presentation focused specifically on the history of LGBTQ Pride and relations between police and queer people, especially QTPOC. Prior to the final decision to remove police from the parade itself, OutReach had asked for and gotten a compromise from MPD Pride, the contingent of LGBTQ officers and allies that has marched in every parade since 2014. They agreed not appear in uniform or to bring along any squad cars or other official police vehicles. 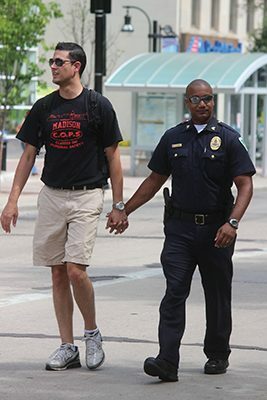 Lt. Brian Chaney Austin, a member of MPD Pride who is himself an out gay, Black man, told a community listening session held the week before the parade that although he and his fellow LGBTQ-identified cops were personally upset by the decision, they understood and respected OutReach’s position. Held at the Madison Central Library, the forum drew in close to 90 participants for a sometimes heated but largely respectful conversation about the issue. Those who supported removing official, on-duty law enforcement from the parade cited ongoing concerns especially from queer and transgender LGBTQ+ people over feeling unsafe with armed police marching side-by-side with them. Others pushed back, arguing that the MPD has come a long way in its policies and procedures, and that asking even its LGBTQ-identified members not to march constituted discrimination and a step back from hard-won progress to serve openly. Schalk reiterated her question about how the decision caused harm. Chaney Austin spoke up on behalf of the officers, noting, “I live on both sides of the fence, y’all. It is quite challenging to be in the position I am…I grew up in Chicago. I had some bad experiences with members of law enforcement. From my perspective, I am trying to do something good with something that has been identified as broken. It is incredibly small and fragile baby steps that we’re taking in this mission. My hope is that we can continue to talk, my hope is that the very people who have really valid concerns and fears—I get it—I wanna talk. I wanna be able to sit down together in a small, potentially group environment where it’s potentially easier to have that dialogue. And then I can try to bring it back to my department to bring change. The MPD’s new transgender and nonbinary Standard Operating Procedure (SPO) was touted as one way in which LGBTQ officers on the force had worked with the community to create more inclusive policy. Police worked with OutReach’s Transgender Health Advocate, Ginger Baier, to create the SOP, which seeks to enshrine in official documentation how police should interact with and treat transgender and gender non-conforming people while on the job. Chaney Austin told Our Lives that all officers had recently received a one-hour training regarding interactions with and education about the transgender community. In an interview with Our Lives, Chaney Austin laid out what he thought the challenges and goals were likely to be in the future. Over the course of July 31 and August 1, at least three queer people of color left comments on the official OutReach Pride Parade Facebook event page questioning the continued inclusion of police, and, in one case, calling OutReach’s decision racist. The comments were deleted at some point in the early morning hours of August 1, and commenting turned off entirely for the event. Those comments snowballed into a series of community discussions and arguments in various corners of social media. Lutzow and Heineman-Pieper started what was eventually called the Community Pride event in protest and began urging others to boycott the parade. Letters were sent by protesters to every organization and business listed as an official sponsor of the OutReach Pride Parade, asking that they drop their support. 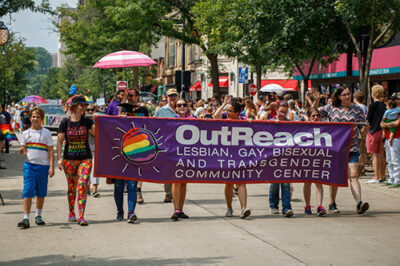 Prior to OutReach’s final decision, according to Botsford, groups that had withdrawn from Pride are the WTHC, Orgullo Latinx LGBT+ of Dane County, Diverse & Resilient (which had already opted not to participate due to scheduling constraints), and Planned Parenthood Advocates of Wisconsin. There are as many differing opinions around this issue as there are people in the community. On one end, the argument goes that police should have no role whatsoever—even for security—at a Pride event. Perhaps even holding a parade is too mainstream, and the community ought to revert back to its radical protest roots. Like Banks, many point to the origins of Pride in the U.S. as a series of anti-police riots, including Stonewall. There are ongoing issues with police at Pride events in various parts of the country, too, as well as institutionalized homophobia and racism within law enforcement as a whole. On the other side, LGBTQ people who are themselves police (and their allies) wish to be included in an event celebrating all aspects of their identities. The argument in favor also includes the idea that it’s a sign of progress to have any police attend Pride in a friendly way (and to have openly LGBTQ officers), given the history of animosity between the groups and the hard work that has gone into making it possible to be out as a police officer. Others still can understand the need for police security but would rather they didn’t march in the parade, or if they do, out of uniform and without weapons. Of course, it’s important to recognize that the modern LGBTQ Pride movement didn’t begin only in the U.S., but rather in a variety of ways in all parts of the world. The current movement is as diverse as its people and locales, with different issues impacting various communities in different ways. The question for now seems to be, what real work can and should be done to make sure all members of the LGBTQ community are heard, valued, and supported? And how do you ensure that process without tearing down what few resources the community has in place for that support, especially in an era of increased hostility to LGBTQ people and people of color? Madison is NOT Ferguson! What other town recruits police candidate as “social workers in blue”? Police divide the community? It’s the Black Lives Matter wantabes with their PC Correctness that is dividing and damaging our community! Once again in the “town of the perpetually offended” we have a small group trying to force it’s will on the larger community. When OI was attacked by the brick-throwers, who did you call for protection and to investigate the incident so others weren’t also attacked? Black Lives Matter posers? Yes, I feel we must stand in unity with the real Black Lives Matter movement, but this is not the way to do it. Did you see their faces at the march? Almost all white! And where will these “community leaders” be in 2 years, after they’ve done their damage and moved on the greener pastures. Shame on OutReach for tolerating this zealot attack on our fine officers, who put their lives on the line every time they put on that uniform. Who’s next?? ?